Here are a couple of my creations from back in the summer. They were a gift for one of my daughter’s friend and her younger brother. She loves snakes and has a ball python named Monty. She held her birthday party at the local snake farm, so it only seemed fitting to give her something reptile-themed. I crocheted Monty out of some yarn I have been wanting to buy forever but never had a project for. It’s Sinfonia yarn that I bought at Hobby Lobby. So since the yarn is a thinner yarn I knew it would be perfect for the ami snakes. 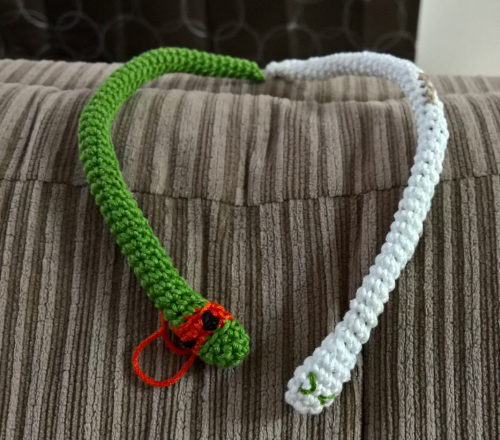 I did a Ninja Turtle snake for her younger brother who is wild about TNMT. Both were a big hit. I hope to make more but surprisingly it is time-consuming. I hate going in a small round although it looks awesome it takes a long time. If I ever do a craft fair again, this will be one item I will make since I used a pipe cleaner in the body to give it some bend. I would like to try it with a stronger wire to possibly make a bracelet. That will be for the future as I have a few crochet projects to finish before the end of the year.